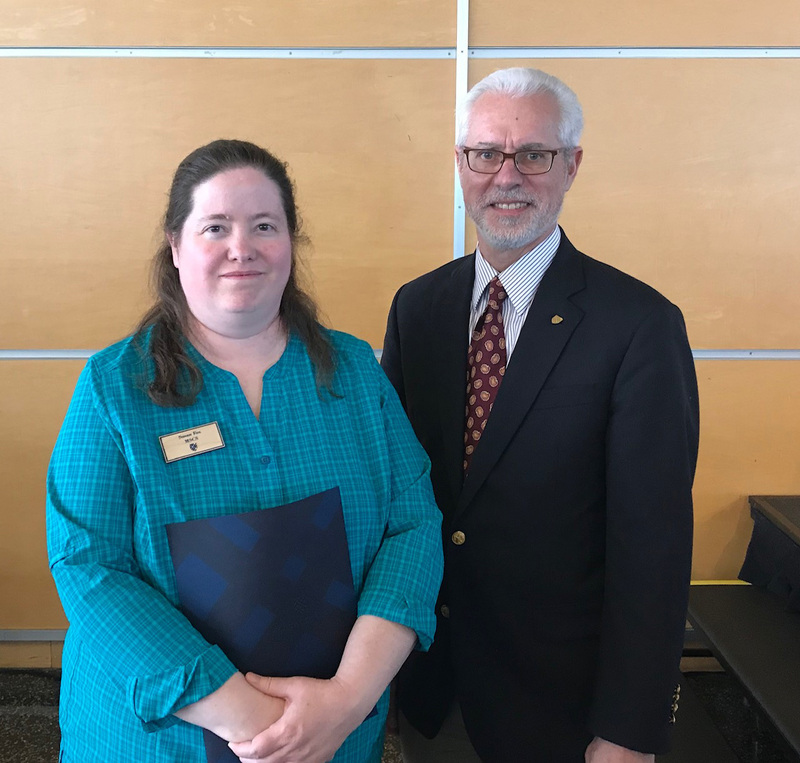 We are grateful and proud to present you with the 2019 Jack and Marty Rossmann Excellence in Teaching Award. The faculty, students, and alumni who wrote letters in support of your nomination describe you as a consummate educator, someone with a deep grasp of her subject and a passion for sharing that knowledge with her students. Citing your incredible dedication to those same students, they also describe this nomination as long overdue. Given the nature of your expertise, it seemed appropriate to begin with some quantifiable assessment of what you have done for Macalester, and what you have meant to the people here. You have been teaching with us for 24 years; in that same time, you’ve offered more than 20 distinct courses within the computer science major. Your average class size is 29, a fact your colleagues attribute to your eagerness to accommodate every student you possibly can. In fact, you make it a priority to meet with every computer science major and minor, and have developed a spreadsheet to track the progress of each student hoping to enroll in computer science—242 in total—to ensure everyone has a fair shot at courses with limited seats. And you don’t limit your service to the classroom, either: over the past decade, you’ve sponsored and supervised nearly 200 internships, independent research projects, and tutorials—the latter being informal courses you’ve developed yourself and taught outside your usual five-course load. Reading through these letters, a few consistent themes arise. They marvel at how you manage to teach and mentor so many students, but they also universally praise the lengths to which you go for each of those students. Anecdotes abound of you staying late, setting aside your own work, and hosting weekend office hours to help every student get the support they need. Students and faculty members alike praise you for your teaching methods. They credit you with revamping the entire introductory curriculum, from old-fashioned lectures to active, participatory courses. Students point out that you relate dense and difficult material with astonishing clarity. One alum recounted using notes from your classes to prepare for job interviews in the software world; another wrote that, in her decade of experience at Microsoft, she’s found she learned more from your introductory course than some colleagues learned in their entire course of study. In your interactions with your colleagues, you’ve become a role model in the department. Junior members of the faculty praise you as someone they look up to, learn from, and strive to emulate. One called you “truly the best teacher and mentor for Macalester students” she had yet encountered. Beyond the content of your teaching, the computer science community also credits you with striving to make your classes—and by extension, the entire department—more equitable, inclusive spaces, particularly for other women. Across the major, the number of female and male students enrolled in CS courses are roughly equal, something your colleagues describe as “unheard of” in the field, and a fact they attribute in large part to you. One final theme arose in your nomination. Many writers described you this way, but in the words of one: “Susan is unfailingly humble and modest, and her work has regularly fallen under the radar on our campus.” It is our honor today to correct that, and to recognize and celebrate your incredible dedication to your students, your service to your department, and the profound impact you’ve had on Macalester College.